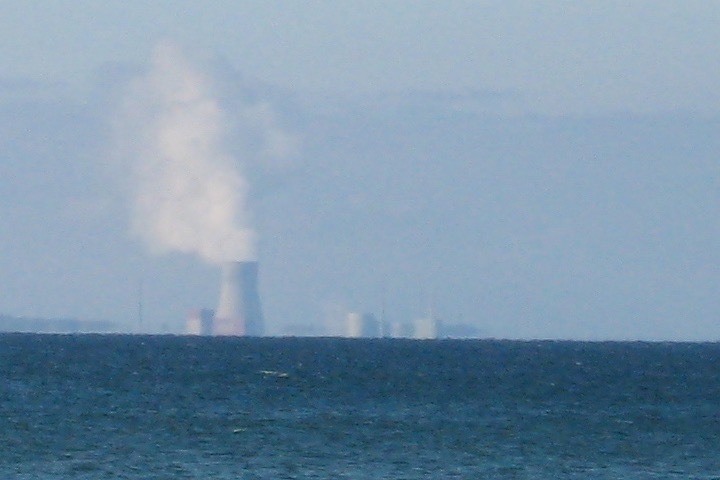 Exelon Is Reaching Into Your Pocket to Bail Out Its Aging, Failing Nuclear Plants in New York. Here’s How You Can Help Stop It. If you pay for electricity in New York, your bill doesn’t show it, but you are paying corporate giant Exelon, the largest nuclear owner in the country, a hefty subsidy to bail out its aging, failing nuclear plants, to the tune of $40 million a month, or $7.6 billion over 12 years. New York ratepayers have already been touched for nearly $800 million since this began. Exelon ramped up its lobbying expenditures, then demanded and received ratepayer subsidies. 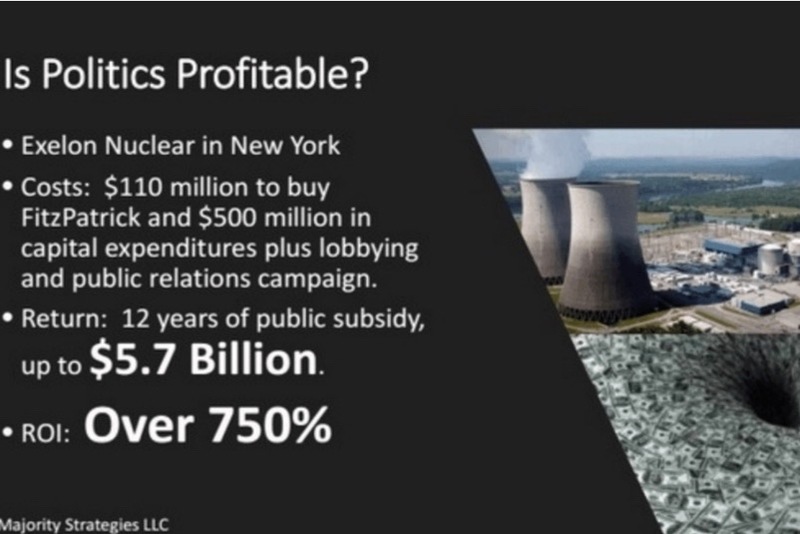 A 2017 presentation by a former Exelon consultant resurfaced this year which calculates Exelon got a 750% “return” on its lobbying “investment” in New York. One slide asks rhetorically, “Is Politics Profitable?” and shows copious amounts of cash spiraling down a vortex. That about sums it up. New York’s Public Service Commission granted Exelon’s nuclear reactors subsidies in the form of “Zero Emission Credits,” on the specious theory they fight climate change. But they don’t. These plants are dirty, dangerous, and seek subsidies because they can not compete economically as costs for cleaner forms of energy decrease. Propping them up with ratepayer surcharges undercuts investment in renewables and efficiency that really would fight climate change, making consumers pay instead to swell Exelon’s already massive profits. Ratepayer surcharges from New York and several other states accounted for some 60% of Exelon’s profit growth this year. The PSC rammed the New York subsidies through with little opportunity for public comment. But there is still a way for the public to fight back: Support the Legal Environmental Advocacy Fund Hudson Valley (LEAF). LEAF is helping lead a key legal challenge to this wrongheaded wealth transfer in New York State Supreme Court (Hudson River Sloop Clearwater v. NYS Public Service Commission, Albany County, 7242-16). It’s a landmark case, because it’s the only one to focus on the fundamental (de)merits of State nuclear subsidies. It’s also the last, best chance to beat state nuclear subsidies in court after federal suits on more technical jurisdictional grounds failed. If we win it, it will stop nuclear subsidies in New York, and could set an important precedent for other states evaluating clean energy policy. And we really could win, no matter how many lawyers and how much money Exelon funnels into this suit. Exelon has bragged to its shareholders about “successful dismissal of legal challenges of New York and Illinois ZEC programs in federal district courts,” but it hasn’t been able to derail the case before the New York State Supreme Court. Our suit survived a motion to dismiss by Exelon and the PSC, which means the judge knows our case has merit, and that the fundamental problems with nuclear subsidies -- e.g. that they violate due process and the public trust – are finally going to have their day in court. We’ve made it this far with a dedicated coalition of citizens’, environmental groups, and public interest lawyers who have donated countless hours, but we need to raise some money to bring this suit to its conclusion,. We need $50,000, which has to be a tiny fraction of Exelon’s legal budget. Last year, Exelon made over $33.5 billion -- about 670,000 times what we need to raise. In this David-and-Goliath fight, $50k is the stone in the sling that could bring these giant subsidies down. The Hill: A Nuclear October Surprise?